Pinball machines have been a staple of arcades for decades. 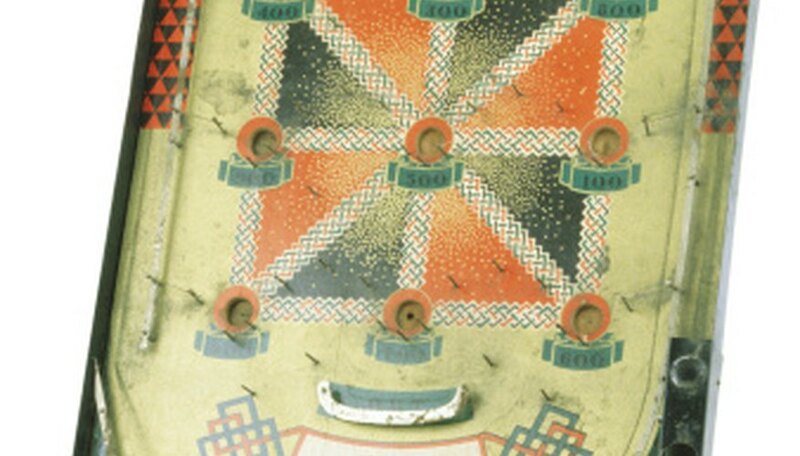 The first pinball machine was created in 1931, but pinball games only started to gain in popularity following World War II. Today, advanced pinball machines include LED lights and color dot displays. You can build a machine for your own game room out of wood. With a little patience and an afternoon of work, you and your family will be challenging each other to pinball championship games. Cut a baseboard to the appropriate size. Prop up one end and roll your marble or ball bearing down the board. Change the baseboard height until the marble reaches an appropriate speed. Measure the angle at which your board is propped. Make the appropriate size legs or wedges to give your table the optimum angle. Nail the baseboard to the legs and attach side pieces. Glue a piece of wood at the top and bottom of the table to keep the marble in the pinball machine while you are playing. Drill a hole one on the right of the front board piece. Place your plunger mechanism into the hole and test it. Glue or nail a strip of wood next to the plunger to keep the marble from rolling around the board. Install a hinged wooden flap at the end of the plunger chute to keep the marble from falling backwards. Install your flipper mechanism. Make the flippers are far enough apart that the marble will not get stuck when the flippers are not in use. Make a cup or tray to catch the ball after it passes through the flippers. Add features to your pinball machine such as golf tees or nails the ball needs to travel through, elastic bands, rubber stops, tunnels, traps and lights. Create a theme for your pinball machine. Paint the pinball machine and add any additional features that support the theme. Read all instructions before operating any power tool and use it with care.